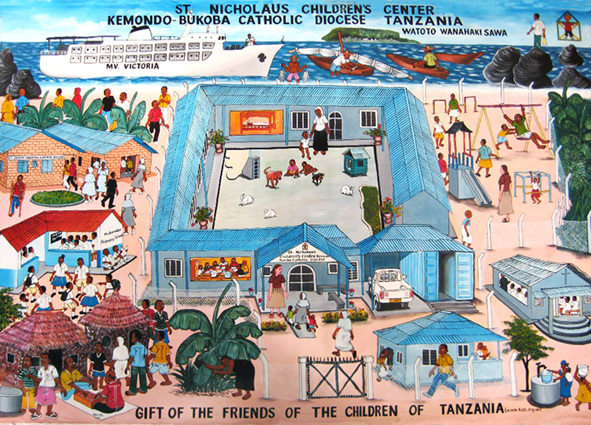 St. Nicholaus Children’s Center Kemondo (NCCK) is a residential home for orphaned, disabled and vulnerable children operated byBukoba Catholic Diocese, Tanzania, East Africa. Tanzania is one of the poorest countries (population: 41 million). Bukoba town is located on the west shores of Lake Victoria in Kagera Region. In this region, AIDS and Malaria are the two biggest health issues. At present, the official infection rate is 9 %. In 2010, 4.2 Million children, i.e. 28 % of all children under 15 have lost one or both parents. This highly impacts the family structures of the Tanzanian society. Valuable knowledge is not passed on to the next generation because the generation of parents is dying. Local communities (extended families, village community) are overwhelmed by the task to raise the orphans. n Tanzania often times disabled children suffer from a severe lack of care, do not receive the therapy they need, are hidden away inside the huts and sometimes they are abandoned. St. Nicholaus is a home for some of these children, especially for disabled children who do not receive the care they need in their families. The project started in January 2010. In the meantime the center has been built and will be officially opened on October 13, 2011. St. Nicholaus will be a place where disabled children can live and go to school. The center shall also be a place of support for families who care for a disabled child. The long term goal is to provide education and skill training for the youngsters so that they may be able to help support themselves and to live an independent life as much as possible. At this time St. Nicholaus is designed to care for about 30 children and youngsters. Presently nine children have been placed with foster mothers. Until the center is completed, they are living in rented apartments near the building site. The children are between 2 and 18 years old. Five of these children are mentally and physically disabled and cannot attend the local schools. St. Nicholaus is being built in a simple building structure with the option to be extended later on according to the needs and its financial capacity. St. Nicholaus has become a reality and has been made possible through the generosity of sponsors in the USA and in Germany. In Tanzania often times disabled children suffer from a severe lack of care, do not receive the therapy they need, are hidden away inside the huts and sometimes they are abandoned.